Congratulations on your new little one! Use this design to announce to the world that your precious boy or girl has arrived. Do you like the design but planning different colors? I can change the colors for you for as a design upgrade (extra charges may apply) Just ask about the colors before buying. We also offer a $5 rush fee option in our shop. To receive your invitation within 12 hours you can purchase this listing along with your invitation so that we know to send it to you ASAP. 1. Size you'd like as a JPG file or 2 invitations to an 8.5"x11" PDF file. 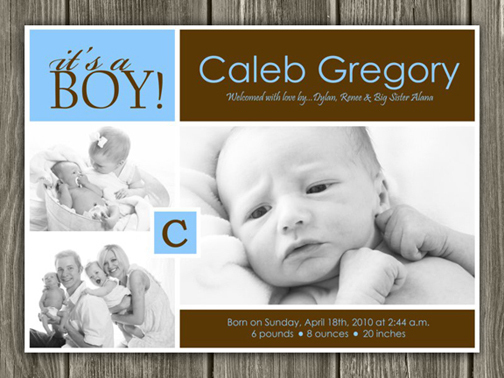 You will receive the invitation and thank you card in 300 dpi high resolution jpeg format. You can print on your home computer or upload your invitation to any photo lab or printing place. PDF files cannot be printed at a photo lab, but can be printed somewhere like Staples, Office Max, FedEx Office, etc.